The Pet Community is a fun new "global social network for pet owners." So, Facebook for pets, right? Kind of! Read on for more info and details on how to sign YOUR pet up for its very own social networking profile! Currently in its Minimum Viable Product phase, The Pet Community is brand new to the pet lovers' landscape but already has a sizable number of pet profiles on board, such as Nala Cat and Cole & Marmalade. The site features "Celebrity Pets," "Funny Pet Pictures," and an interactive Forum with more features to come. You register yourself as an owner, and then add your pets' profiles! 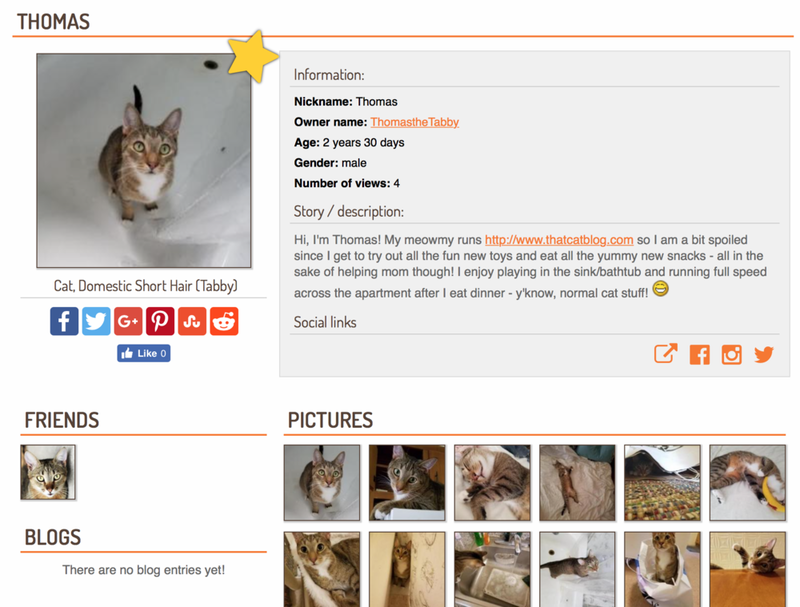 Each pet gets its own page, profile pictures, "About Me," and stats like name, age, and view counter. Owners can add pictures, videos, and even write a blog on their pets' page. Join us with a profile of your very own and shoot us a friend request when you're on - you might even be eligible for "Celebrity Cat" status! Jan 14 11 Great Ideas For Dress Up Your Pet Day!